Released on May 4th, here we have the Disney Store exclusive Inside Out Animated Talking Anger! This soft plush toy stands at 9" tall and features movement and phrases. 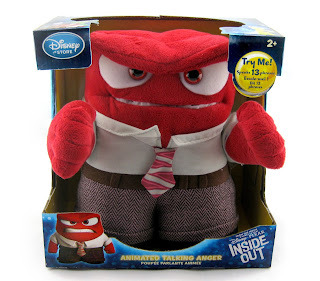 Press his left hand for his "animated" action- Anger shakes his fists in fury and says one of 13 sound bites from the film (his mouth opens and closes when he speaks as well, which is pretty cool). Did I ask for that gum commercial!? Oh, I'll show you attitude old man. You wanna piece of this pops?! Come and get it! Oh that's how you wanna play it old man? No dessert? Oh, sure...we'll eat our dinner after you eat this!! I have to say, this toy is just plain awesome. I love his detailed sculpt and embroidered features (as well as his cloth shirt, tie and woven herringbone pants); it's by far the best likeness of the character I've seen in a plush yet. His movements are really fun and realistic and his phrases/growls are totally hilarious (the sounds are not too loud or too quiet, which is nice). It's really top notch! He's recommended for ages 2+, requires three AAA batteries (included) and retails for $29.95. Check him out in action on YouTube HERE (I didn't have time to make my own video review, but this one does the job). 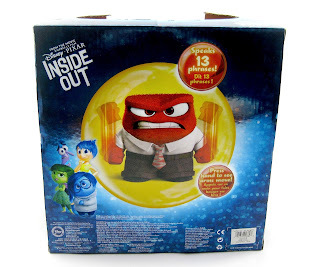 If you're a fan of Inside Out, especially Anger in particular, than this is the toy for you! Adults and kids alike will love this. Check your local Disney Store for availability or purchase it on their website HERE. You can also purchase it on Amazon below or eBay using this direct link.